Elegant environs and meticulous cooking are both present at this Hong Kong outpost. Bypass the couture brands on the lower floors at Hong Kong’s swanky Landmark shopping mall because the true glamour here is gastronomic. Floors four and five is where L'Atelier de Joël Robuchon welcomes the stylishly clad appropriately with a dim black catwalk extending to the trademark dark granite floor. 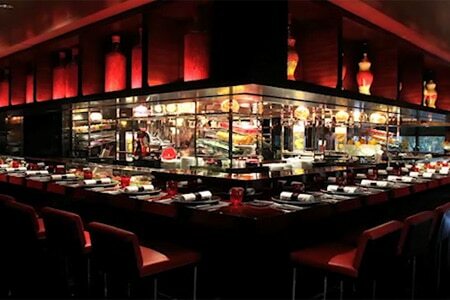 Striking and almost distracting red and black hued splashes dot the shiny dining room where regulars slide onto bright red-stained, tall leather stools tucked into a sushi-style bar facing the open kitchen. Kudos to the amiable sommelier who provides insightful counsel on the 1,300-bottle list where old, mainly French vintages and affordable wines from around the world comingle. (Unfortunately such fine service does not always extend to the waitstaff.) Dishes prepared with the freshest ingredients are cooked simply but with finesse and precision. Creative starters on the tasting menu might be the inventive cherry-gazpacho soup with ricotta sherbet, or a fixture like the tomato "millefeuille" layered with crab meat, avocado and green apple. Favorite mains run from the tender pan-seared Kagoshima beef anointed with Parmesan and black truffles to lighter fare like the black cod filet with a lick of daikon cream and extra virgin olive oil. The small-portions menu, featuring thinly sliced vegetables with eggplant caviar and sea urchin risotto with spicy artichokes, is made for those who wish to fit into the frocks downstairs. More indulgent diners may wish to walk away with flaky croissants, breads and pastries from the mini-bakery down below.